That's me marching down Abbey Road in London! It was flirting magic! I started to tell myself, "I am a Beatle." (I love the Beatles!) The next thing you know, I was called to England to do their #1 morning show. 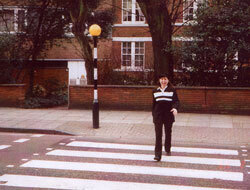 When I arrived, I went to Abbey Road and christened myself a Beatle. Look how my outfit matches the lamppost and the street! 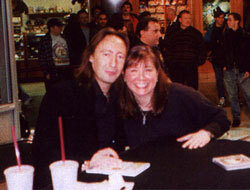 Speaking of the Beatles, John Lennon is one of my hero's and that's his talented son, Julian Lennon, who I met at The Mall of America in Minneapolis. I gave him my book Flirting with Spirituality and he said, "I like that!" I was so excited, I started to jump. Luckily, he's a good flirt too and he giggled along with me! That's my adorable hubby and business partner Joe Brozic. 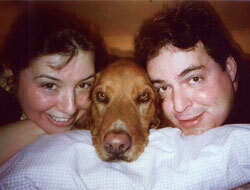 The furry guy in the middle is our dog/son Buddy Brozic. We call Buddy our vice president of fun at our company, Goal Getters. Joe and I have been married since 1993. I'm so happy to have such a great husband who flirts with me everyday! That's our first book Flirting for Success published in Lithuanian! It's so cool cause Joe and I always say we're a part of the flirting revolution. Doesn't this book look like revolutionary propoganda? I can see people marching, shouting "Flirtas! Flirtas!" 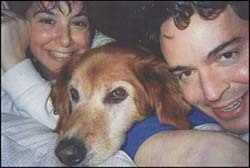 Here is another picture of Joe, Buddy and me. Don't you just love Buddy? 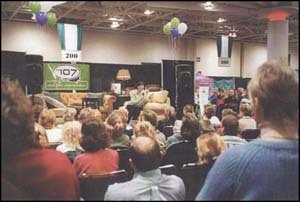 That's me speaking at a Women's Expo. Speaking is such a blast! I went to see a play about Buddy Holly in London. In the middle of the play they handed out programs that duplicated the programs to his final concert. Mine had a special blue sticker on it. A man from the stage said "who has the program with the sticker?" I jumped and shouted "ME!" He told the audience to give me a round of applause. It was magical! After the concert, I bought some Buddy Holly glasses and put them on so my sister could take a picture of me. 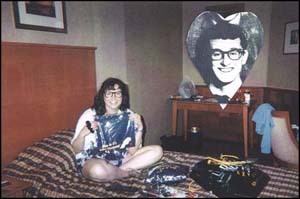 Then I pasted a picture of Buddy Holly in the photo. Don't we look exactly alike that night? 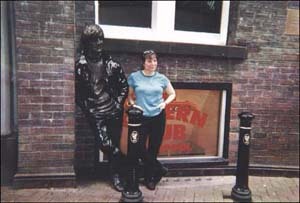 That's me in liverpool posing like John Lennon next to his statue. John is too cool. He flirts with me in my mind! Look! 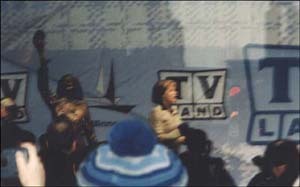 It's Mary Tyler Moore! She came to Minneapolis to unveil a statue of her. 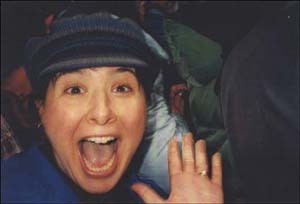 They gave the crowd hats just like the one Mary tossed in the air on her show. That hat in the crowd is me, hee-hee! And there I am waving to you! 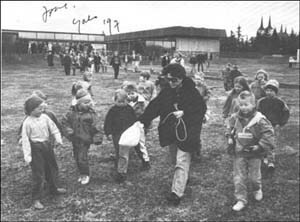 That's a postcard from Yoko Ono. I sent her my book "The Pocket Pep Talk", which was based on her art called "A Box Of Smile". She sent me this postcard back with a lovely note. I treasure this postcard! Thank you very much Yoko! 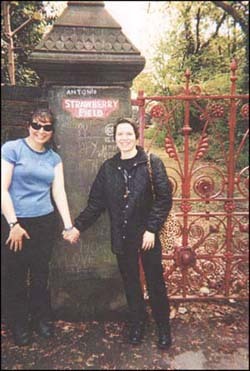 That's my sister and me at Strawberry Field in Liverpool. That's why I love The Beatles. They teach us to celebrate the details and moments in our lives! When I take photo's, I look for hidden pictures in them. I call that Flirtography. 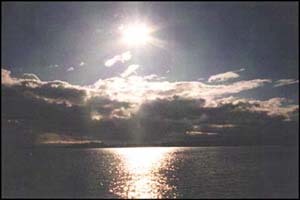 In this picture I see a face in the sky looking at me. What do you see? 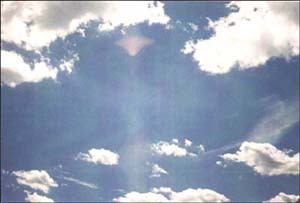 In this picture, an angel appeared in the photo! I love these photos of Joe and Me in a photo booth. We were cracking up!